"...Save the Lives of Many People"
I know many of you want to know what happened that caused New Creations Chapel to close the Christian Residential Boarding School, the College, the Christian Camp Program, and the sale of the New Creations Campus. First of all as CoFounders, Bonnie and I, and as President of New Creations I thought we would never ever sell our campus of 720 acres plus all of its buildings and the Cross! Today I believe it was the leading of God! We had been doing great and growing since the day we moved onto that campus. 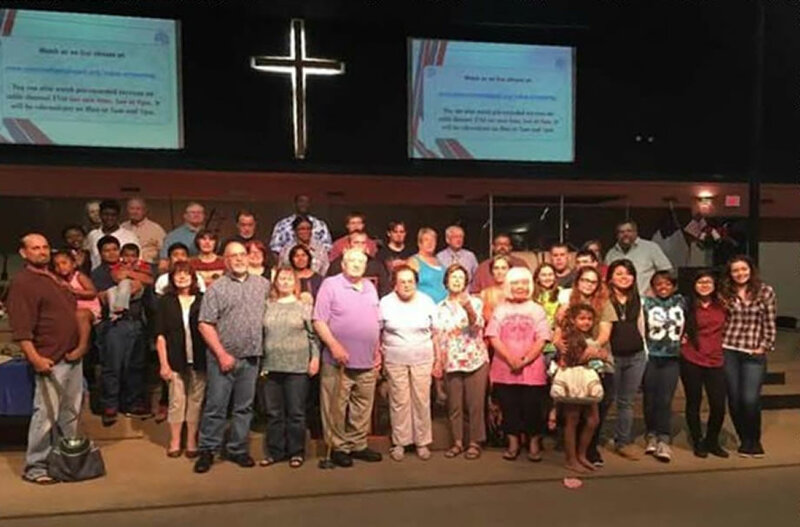 We went from a choir to a church, with a focus on residential boarding school for troubled youth, a college, accreditation programs, helping other churches, ministers and missions. The Following Is What Happened! We were growing and reaching many for the Kingdom of Jesus Christ. As we grew, our overhead grew; but we were ministering to so many youth, and many were surrendering their lives to Jesus! Then, I believe with all my heart God wanted us to change from a church with a focus on troubled youth to a church with a focus on ministering, coaching, training, pastoring, and assisting young people, new ministers, missionaries, and religious leaders, (men and women) and seasoned pastors and their churches to grow and develop for the next great move of God. My problem was I could not believe that God was taking us from what I would call the most stressful and challenging ministry any man and wife could ever undertake. Even though we knew a change had to be made, we just couldn't do it, because we loved every child with all our heart, and we had a contingent plan to carry on and to aide in this ministry until our deaths. We had trained Revs. Jeff (48 years old) & Marilyn Lowery and Revs. Kevin (also 48 years old) & Jennifer Bodey to assume control and continue ministering to the troubled youth God would send to New Creations. All the time while Bonnie and I would travel and raise funds for this great calling. Then on May 17, 2014, things began to change when Rev. Kevin Bodey, with all the much needed degrees (BA and Masters) New Creations Boarding School and College needed to carry New Creations into the future, had a major stroke that caused long term disability. Five days after that Rev. Jeff had a massive heart attack. This meant we had no future leadership trained to take over. I don't believe God caused this, but God took a bad situation and turned it to good. "You (devil) intended to harm me (Pastor Tim), but God intended it all for good. He (God) brought me (Pastor Tim) to this position (ministering and working through others) so I could save the lives of many people." (Genesis 50:20 NLT) As of today July 2018, Revs. Jeff and Marilyn are in the country of Panama building a ministry, and Revs. Kevin & Jennifer are in the state of Texas building their ministry. So, we went from May of 2014, believing the two would return from their illnesses to take over, to August 2015, when Marilyn had a major stroke, and we realized it was NOT going to happen. We tried to get other ministry leaders in to take over New Creations, when we had a God realization. Having a church that focused on troubled youth in Richmond, Indiana, was over, because God was saying it's time to close and go to your next ministry. So on July 31, 2016, we closed the boarding school, and on August 30, we closed our camp program. From the day it was decided that we would close, July 7, 2016, I was a mess. We did not have the strength to carry on, the time to train new leaders, or funds to wait on new leadership. With the aging and retiring staff, the high cost of overhead and knowing God was changing our (Bonnie & my) calling and our direction, we would have to sell the campus and buildings. We want to thank God for those that helped us during our time of transition with the sale of the property. They did a tremendous job. They sold the property in October of 2016. My whole heart's desire was that whoever purchased the property would keep the cross open to the public and keep the lights on it at night. I trust this happens. Bonnie and I never would have been able to get everything moved off the campus, or to sell the property had it not been for our two sons, Jason and Mark and our spiritual son Jeff Raatz. No words of thanks could ever be spoken to express the appreciation for all the help which Bonnie and I received from Pastor Ray Rothwell, former staff, friends and supporters, who also helped Bonnie & I financially and moving off campus. We now will be able to see and take part in the next great move of God. We left the property on January 30, 2017. The closing of our 40 years of vision on our US 40 and Interstate 70 property. New Creations Chapel did have some funds left from the sale of the old campus that will be used to start our new vision on a new campus. It is also our plan to raise and donate money to missions, churches and other religious organizations. We have never been able to give more than $50,000 a year, however, we are believing in the future that the Lord will generously provide in order for New Creations to be able to give over $1,000,000. Thanks to all who have kept donating to New Creations. You have made it possible for New Creations to continue and now again to "...save the lives of many people." We are going to mentor, coach and pastor men and women, called of God to start or build on their existing ministries. Whether it be churches, missions (foreign/domestic), or other religious organizations, as long as it is Biblically founded. We will also continue raising and giving money to missions, churches and other religious organizations yearly. Yes, God still has the call to children 6-12 years old and youth 13-23 years old on us, and we will continue ministering to them as God leads us. Much of New Creations' ministry will remain the same. We will hold Church services. We will not, however, have a K-12 Chris-tian Residential Boarding School or a College. In the past, we spent thousands of dollars on accreditation; we just don’t feel called to do that anymore. We will have a top quality Training Educational Facility where we will train others to know what is Biblically available to them. When in the future we have acquired enough land for RV parking, camping and a lake, then we will reinstate those programs. We are currently searching for up to 50 acres, no more than that. When we acquire a Church building, we will also continue the Lights Exhibit. We are also looking into ideas about the Cross Ministry located at Interstate 70 and State Rd 40. Pastor Larry Thomas and I have both expressed interest in prayer services for anyone who is drawn to the Cross. One big difference will be we will not go into debt. Our funding will continue to come from donations, tithes and offerings. We will continue to remain free of government funds. Rev. Bonnie and I will continue to travel and speak at different churches, though it will not be as often. We will continue going to Florida where we will work out of Foundational Church in Englewood, FL. We are dedicated to carrying out ours and other churches' callings. We will fly between our Richmond, Indiana and Port Charles, Florida offices, homes and ministries as needed. New Creations is going to focus on getting those men and women called of God to become Ministers in Training, Licensed, and/or Ordained through New Creations. We will mentor, train, and aid in whatever way possible to help them succeed in winning souls for Jesus Christ with their ministry visions. We will also help them attain membership in Faith Christian Fellowship International (FCFI), of which I am Bishop.